← Free eBook Download at Amazon.com, March 25 ONLY — get your free copy of The Smile Routine! Quite by accident, I discovered that there is concrete evidence linking alcoholism and mouth cancer. Alcoholics have higher risks for certain cancers due to their heavier consumption of alcohol. 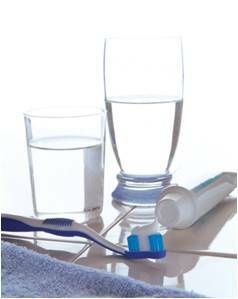 This quantitative analysis of mouthwash use and oral malignancy revealed no statistically significant associations between mouthwash use and risk of oral cancer, nor any significant trend in risk with increasing daily use; and no association between use of mouthwash containing alcohol and oral cancer risk. He goes on to say that if people floss their teeth, brush properly and have a good diet they should not need mouthwash at all. So what does this all add up to for those of us who want to use mouthwash? I, personally, have made recent efforts to reduce my exposure to alcohol-based mouthwash products. The studies that definitely link alcohol to higher risks for cancer point to the high levels of alcohol consumption generally associated with heavy drinking and alcoholism. As a mostly non-drinker, I’m comfortable that my overall oral exposure to alcohol is low. Even so, I’ve taken steps to reduce my exposure by relying mostly on mouthwashes that do not contain alcohol. As an everyday individual, just like you, my concerns come from realizing that there has been controversy on the topic of alcohol-based mouthwashes for years that has been completely invisible to me. Realizing that there are long-standing questions on the subject has made me uncomfortable, so I’ve chosen to use more alcohol-free products in my own personal Smile Routine. The great results that I have experienced from practicing The Smile Routine are not about the products, it’s about the routine. I’ve safely used a variety of products for 30+ years without complications, keeping in mind that I still have regular dental check-ups. The Smile Routine is a set of very simple and easy steps that have helped me have cleaner teeth, fresher breath and a nicer smile for decades. Because we’re each a little different … or a lot different, even … it’s important for you to use the products that work best for you once you adopt The Smile Routine. Though I am not a healthcare professional, I do strongly recommend that everyone should discuss any concerns that they have about alcohol-based mouthwash with their chosen healthcare professional. I will be interested along with thinking about what you’re currently talking about below.